The Grey (2012) – Liam Neeson is tormented by his past and driven to the brink of suicide in a northern Alaska mining camp where he’s paid to shoot the wolves that constantly seek prey. 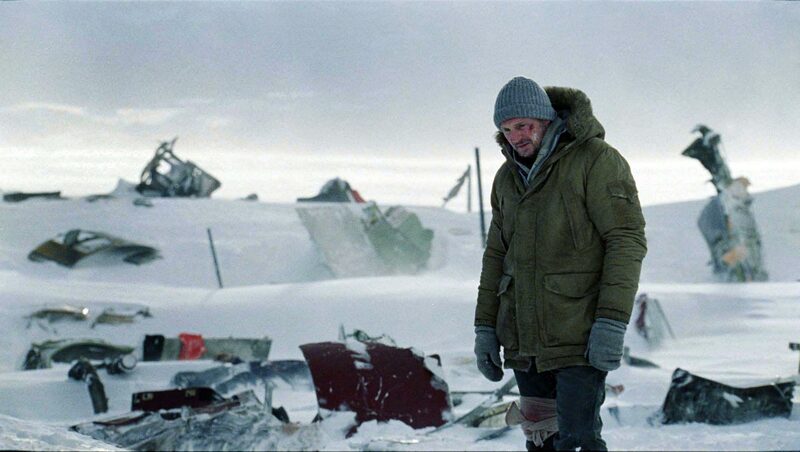 A plane with Neeson and several other workers crashes en route to Anchorage, and the survivors begin hiking toward what they hope is safer ground – but they are pursued by a large pack of wolves. The film is completely engaging and enjoyable (doesn’t it sound delightful from the synopsis?) on its own, but the elements that strain the plot on a literal level enhance the movie if it’s a metaphor. If you watch the film with the wolves as Neeson’s “demons” that he continually tries to pick off – demons that torture him to the brink of suicide – it takes a whole new shape and logic; the more they become stranded, the more the wolves seek him out, relentlessly. In this way, the weakest points become the strongest (“Wait, they got all the way down that huge cliff and there are MORE wolves waiting for them?” Lame, literally; but in a ‘you can’t run away from your demons’ frame, compelling). It also totally transforms the ending. That’s Kristen Stewart as Jodie Foster’s daughter. I know! Same expression! Panic Room (2002) – David Fincher’s most overlooked film, its deceptively simple plots puts protagonist Jodie Foster and her daughter inside a hermetically sealed panic room as 3 home-invaders break in. The catch? What they want is inside the panic room. A mildly interesting, tense film on its own; but if the elaborate townhouse the film is set in becomes Foster’s psyche, it becomes a story of a woman trying to lock away the truth of herself and her life – Labyrinth & The Minotaur style – in the inner most parts of her mind. But that’s also exactly where she needs to go to be freed. The Descent (2006) – A woman loses everything in a car accident, including her child. In an attempt to get her back into the world of the living, friends take her on a caving adventure, which goes terrifyingly (seriously, this film is not for the meek) wrong. There’s a cave-in and they must proceed claustrophobically forward in hopes that there’s another way out… and as they go further, they discover that there are blind, humanoid… things… living down there. One might reasonably ask at the start of the film: wouldn’t a nice beach trip be a more suitable getaway for someone psychologically destroyed by the violent loss of her family? Maybe a cozy B&B? But, of course, that’s not the descent she’s really on, is it? If you see the film as her mental decay, being pushed ever deeper in to darkness and despair, it all makes sense. It ultimately becomes a question of whether to give up, or fight. And if to fight? Just how hard? What will you do to keep going? Seen one or more? Don’t care how they end? Want to comment on a key plot point but don’t want to ruin it for the Spoiler-Sensitive? Be sure to visit the Spoiler Space for a short examination of the endings. Please leave comments here on these films and others you think of that are enhanced on a metaphoric/psychological level. ← Would A Blog By Any Other Name…? I’ve seen two of these! I’ve seen two of these! Is the spoiler space a metaphor for your mind? Oh! I see a link now. Wow. I don’t even know how you did that. Thank you for being the first person to bring me to peace with the ending of The Grey. Maybe there’s hope for Cit-K after all. Spoiler space here I come! I’m like the Movie Whisperer. And I had to wait until it published to add the links. There’s probably a way to do that I don’t know about. I can’t see the big bad wolf movie because I’m mad at Hollywood for reviving this genre. Wolves don’t attack people, and I just can’t let that one go. I haven’t seen the others because they are entirely too intense for me. Finding Nemo almost did me in. If there’s one thing Hollywood actresses excel at, it’s nailing the “undernourished” look. I have to say that as far as Descent goes, after losing husband and child, I would throw in the towel and offer myself to those creatures…. especially if I was stuck in a cave. Perhaps I am just a wuss. I can’t even remember how it ends. I tried to watch Descent 2 but never got past the first 20 minutes. Meh. Happens the same day… apparently she dropped her car keys and there is no one left to give her a lift home and her cell phone battery died while she was stuck in the cave. And blah, blah, blah. So she’s like, “Welp, might as well wander around the cave some more…”? Perhaps she missed the gold on the first trip in when she wasn’t scared for her life. Another psychologically enhanced film is Limitless, starring Bradley Cooper. A former nobody who rises to the top after he takes a mentally enhancing drug. A struggling writer who thought he found invincibility in a bottle. Cooper should’ve known better since he also starred in The Hangover. An altered state of mind only gets you in more trouble. Hm, interesting. I haven’t seen Limitless, but I know the premise – that would be really interesting: a failed writer who dreams of being something great. Thinks about “cheating” aka selling out to be perfect. I think it’s worth watching if you can tolerate Bradley Cooper. He starred in another film called The Words. A tale about a young writer battling his restless spirit.